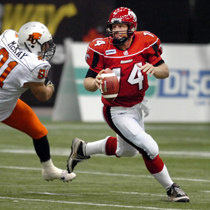 The Dan Marino of Canadian Football is retiring. After 17 years north of the border, Former FSU QB Danny McManus ('85-'87) is quitting while he's ahead — way ahead. 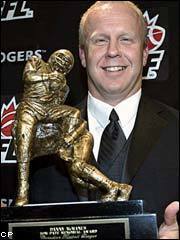 McManus has piled up passing stats that may never be equalled in the history of the CFL, or any league for that matter. If he were in the NFL, his 53,255 career yards would be surpassed by only Marino and Farve. Different leagues, greater degree of difficulty, you say? Maybe. But any QB who throws for 30-plus miles with three downs instead of four, and in below freezing weather on icy fields, deserves more than just having his jersey retired. Though Danny won't be suiting up this season, he'll still be making the rounds of CFL stadiums as an analyst on league telecasts. "I've been playing football for more than 25 years," said McManus. "I've loved every minute of my time in the CFL. Football is in my blood and I look forward to the next phase of my career as an analyst on TSN." Read more about Danny's career, along with his comments, in this story from the Calgary Herald.